Political parties managed to collect more than the required minimum number of signatures to register their political parties, and they did it within 28 days! The dictator, with his claimed 99.9% support of the people, couldn't achieve the minimum number of signatures within 365 days! The dictator has been travelling the country campaigning for more than a year, all with taxpayer funds, bribes [sewing machines, money, new homes and brush cutters, etc], Chinese loans and the support of his military goons and illegal decrees. Despite all their corruption and intimidation the dictator and his megalomaniac puppet master failed, yet again! 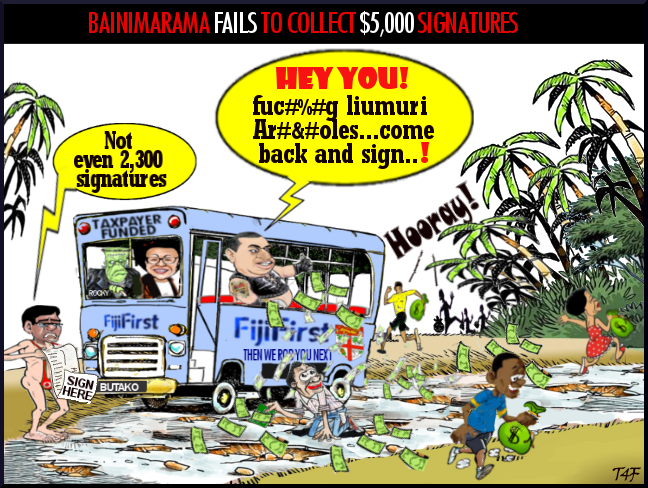 This further reinforces what most sane people already know, that Bainimarama does NOT have the support of the people. Unfortunately this also suggests that Fiji will more than likely NOT be having elections this year. If elections do take place, then a coup can be expected if Bainimarama loses the elections, or Khaiyum will "rig" the election results in their favour.